It’s my gut feeling that there are too many of us with some or other digestive complaint, thinking this is something we have to put up with. We eat well, we exercise, we take medication, yet still our bellies aren’t working properly. Physicians have known for centuries that digestion is the key to health and that digestive problems are behind most diseases. Poor digestion can lead to bloating, gas, a heavy feeling and a build up of digestive impurities, loss of appetite, cravings, not tasting food, understandably, poor digestion brings us down. There are many ways from numerous traditions which give us advice to help get our digestive system functioning and balanced. We are going to delve into the realms of one of them. In the opening verse of the oldest of all extant sacred texts from the Indian tradition, the Rig Veda, the first word besides OM is agni, Sanskrit for fire. In the Vedic tradition fire is worshipped as the earthly manifestation of the creative and regenerative power of the sun. Fire has always been and is an integral part of our lives. It is used in religious worship, rites and symbolism. It is one of the four classical elements: air, earth, fire and water. Fire is heat and it is light. It is also purifying and transforming. Without fire, the greatest of which is the sun, we could not survive. Fire needs oxygen, fuel and movement and if left unattended, can diminish into nothing or become a devouring wall of fury. Internalised fire is an important aspect of yoga, with many yoga practices used to light the spark, stimulating our fire core. This, it is said, leads to the awakening of the inner fire of transformation within ourselves. The agni we will be discovering is one of 13, the digestive fire, found in our bellies. The food we eat needs to be efficiently digested and transformed into energy to keep us going, and essential to this is having a balanced digestive fire, jathar agni. If jathar agni is weak or unbalanced, the body will not receive proper nourishment, becoming unbalanced. If jathar agni is balanced, we can be healthier and consequently, happier. 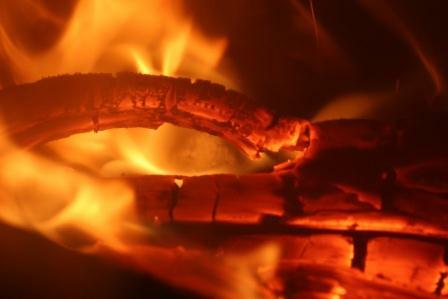 Hatha yoga offers us a lovely, little known dhauti kriya, (an internal cleansing technique), called agni sara, purging by cascading the fire! Agni sara is the ignition to get jathar agni re-lit and keeps it burning brightly within the body. If you feel your fire has gone out, that there’s no hope and you’ve tried everything, the fact that you are reading this means it is possible to re-ignite the flame! 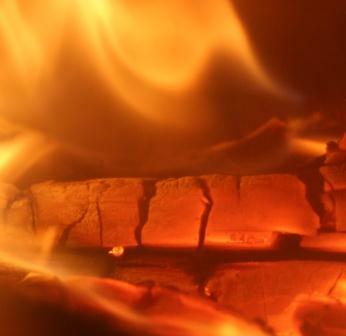 Now is a good time to light jathar agni, to warm us from the inside. However, trying to light a fire on a bed of ash is difficult, so to get the fire burning we need to clear some of that ash away. One way to blow some of our internal unwanted ash away is using abdominal breathing. In itself abdominal breathing is calming and relaxing, so good to use when you are stressed or can’t sleep at night. It gets us to connect with our bellies, preparing us for other breathing techniques and hatha yoga practices. Lie on your back, rest one hand on your belly and take a nice slow, deep breath. Inhale slowly, keeping your chest as still as possible, letting your belly expand as much as is comfortable up towards the sky. As you exhale, slowly allow your belly to float toward the ground. Find your own pace, allow your movement to follow your breath, letting the two become synchronised. Work with abdominal breathing, aiming to get your breath smooth and from there move on to agni sara. There’s no rush, as with all hatha yoga techniques, there are cautions and some definite no-no’s, so don’t go too far or too fast. Although abdominal breathing seems like a basic breath, it is very relaxing, so be careful if you have any condition like low blood pressure or depression. Start by practising 5 rounds, (one round is an inhale and an exhale), and see how you feel, allowing the breath to flow naturally at its own pace, without strain or gasping. Once comfortable with abdominal breathing, you can move on to agni sara. This wonderfully gentle yet intense abdominal exercise is recommended for most digestive problems in yoga therapy, as it helps to heat up the body from the inside. Practiced regularly with awareness, agni sara helps stimulate peristalsis and digestion, improves the elimination of waste, and increases circulation to the abdomino-pelvic area. Once again, there are cautions and guidelines: do not do this if you have eaten a meal 2 hours before, are pregnant, or suffer from chronic diarrhoea, heart conditions, respiratory ailments, glaucoma, hiatus hernia, ulcers of the stomach or intestine. If at all unsure, consult your doctor for medical advice. Agni sara needs thoughtful step-by-step muscular contraction. Picture the typical 6-pack of muscles – the rectus abdominus – which are separate from each other but joined together with connective tissue to give them the segmented look. We usually move them as one, as in abdominal breathing, however, in agni sara we are aiming to move them individually in a ‘C’ shape movement. The movement follows closely behind the breath, and the key to working with agni sara is control, not speed. I usually do agni sara standing with my feet in horse stance, knees bent, hands resting on my thighs for support. This is comfortable and works well for me, but there are other poses you can use, such as easy sitting pose, cat pose, or sitting on the edge of a chair. Choose a position you are comfortable with, remembering to work towards an elongated spine, trying not to round the back. Relaxing as much as possible into your position, close your eyes and see how your belly feels. To start agni sara, do three rounds of abdominal breathing, then on an exhale, follow the ‘C’ shape from the bottom to the top: begin to contract each of the rectus abdominus segments, starting just above the pubis bone, moving in and up towards the spine and the navel. Keeping the tension held below, work up into the diaphragm, underneath the rib cage as far as is comfortable. Allow the exhale to disappear slowly at the end rather than forcing it out. Keeping your body relaxed while staying with your breath, reverse the process on an inhale, (this is sometimes harder than the exhale, so be patient), releasing the muscle segments one at a time from the ribcage all the way down. Remember, slowly and with control. At the end of the inhale, relax the belly without letting it flop and flow into your next exhale. It can feel strange and uncoordinated at first, I remember feeling that I wasn’t moving anything separately, but practice and time are key! You may also find that your back wants to move with the abdomen, that’s okay at first – just focus on keeping the back still, straight and relaxed, over time you will just be contracting your belly muscles with the rest of the body remaining quiet. Continue with agni sara for as many rounds as you are comfortable with. To finish, take three deep abdominal breaths, close your eyes and see how your belly feels compared to when you started. I love the way I feel when I keep my digestive system on track, as it influences so much of how I feel, physically and emotionally. I know that if I don’t pay attention to my flame, my digestive system grinds to a halt, making me irritable, bloated and generally feeling yuk. Not good for me or the people around me! Like all other yoga practices, build agni sara over time – becoming aware of how it affects you and how it makes you feel. By developing and adapting yoga practices to fit in with your lifestyle, your life can be enhanced in ways you never thought possible. If you find agni sara helpful, start adding it where you can into your daily routine, fitting it in where you can – perhaps in the shower in the morning, on the office chair or while watching telly. Never rush it and don’t activate jathar agni to excess – we don’t want to create a forest fire! All we want to do is ignite the flame, and, once ignited, keep the fire burning, using its power when we need it. A content and balanced jathar agni goes a long way in keeping our digestive systems in balance, our elimination good and our appetite regular and healthy. That would put a smile on anyone’s face! In the next issue we look at why the internal fire is so important to a yogi, how to cope after a heavy meal, and bring about happiness by letting the flame burn brightly with uddiyana bandha and nauli. Brenda grew up in Pretoria and has been practicing yoga for the past 15 years. She now lives in a beautiful part of Scotland where she runs regular classes, workshops and the successful ChillOut Yoga Teacher Training School. 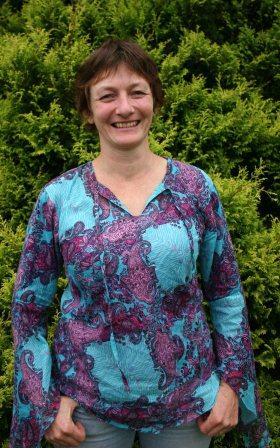 Brenda is planning some exciting workshops in South Africa in 2012 and beyond. More info on http://www.chilloutyoga.co.uk, or email: welcome@chilloutyoga.co.uk , phone +44 1877 389302, or sms +44 7791 385240. Thank you for this insightful article – I live in the Southern Hemisphere, would it be advised to practise also at the start of autumn?